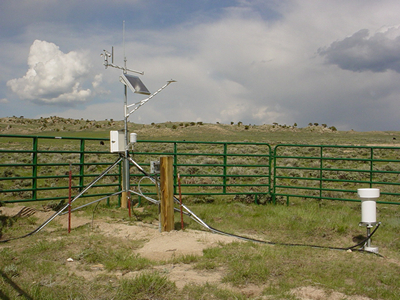 To better understand climate variation and the consumptive use of water, the Wyoming State Engineer's Office maintains a network of twenty climate stations, known as the Wyoming Agricultural Climate Network (WACNet). 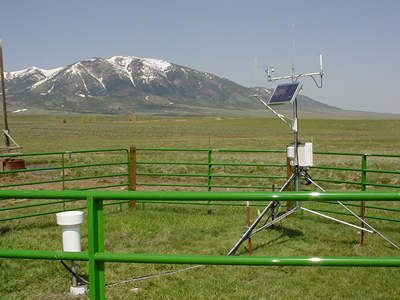 Placed in critical areas to assist in estimating consumptive use of water from irrigated lands, these climate stations collect a suite of variables which enable the application of the ASCE Standardized Reference Evapotranspiration Equation. 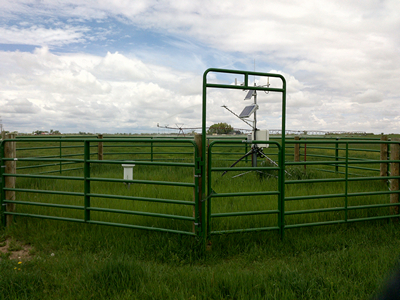 Data collected includes air temperature, humidity, wind speed, wind direction, solar radiation and precipitation. Some stations have heated precipitations gages to enable year-round measurement of precipitation and some stations also measure soil temperature. All stations are located in or adjacent to irrigated fields. The consumptive use of water from irrigated fields (evapotranspiration; ET) is ultimately driven by atmospheric conditions. Sound climate instrumentation is of paramount importance in the development of high quality ET estimates for irrigated lands. Even in cases where actual ET measurements can be made, climate data provides estimates of potential ET, and then allows for an assessment of shortage. While complex precipitation patterns, particularly in regards to summer thunderstorms, as well as variation in soil type and moisture, will always be problematic to ET estimation, good local measurements in agriculturally significant areas will increase the accuracy of basin-wide seasonal estimates. Full-fledged agricultural weather stations are needed at representative locations in all basins to support consumptive use analysis. 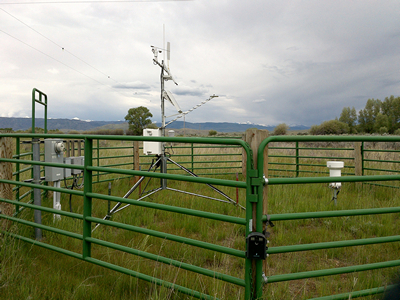 Data from WACNet are downloaded, QA/QC'd and maintained by the Water Resources Data System at the University of Wyoming. 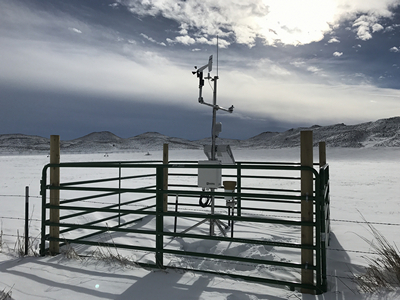 In addition to the normal climate-based sensors, time-lapse cameras have been installed at two locations in the Green River Basin. The purpose of these cameras is to collect additional data about field management because agriculture consumptive use is dependent on irrigation on/off dates, cut dates and other related activities. The cameras are aimed down at the grass and take pictures at the same time every day. From the pictures we can see the grass going through its life cycle, irrigation water being applied, when producers cut, if cows were put on the field after the first cutting and when fall temperatures halt grass growth. These cameras have proven to be an inexpensive way of collecting additional important information.